Back in the 16th century, Franciscan monks brought chilli pepper seeds from the recently discovered Americas back to Galicia on the north-west tip of Spain. Back to the town Herbon in the municipal area of Padron, to be precise. 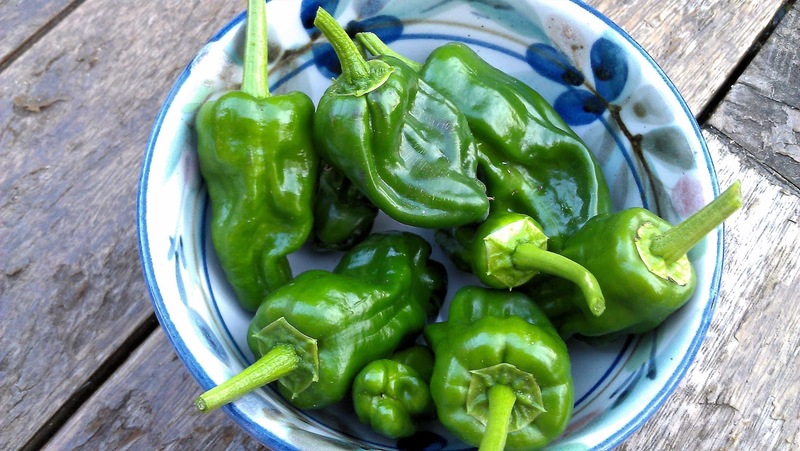 Grown over generations in the green Galician valleys, the descendents of those American peppers adapted to the warm but rainy climate. Today the area grows about 15,000kg annually of the renowned pimientos de Padron, picked when green and about an inch or two long, and fried in olive oil before being sprinkled with salt and eaten with the finger as a tapas dish. The peppers are delicious - but come with a twist. Most of them are mild and sweet, even fruity tasting. But a few in each batch - maybe one in five, one in ten - will be hot. Not as fiery as a bird's eye or Scotch bonnet - but definitely mouth-fizzingly hot. The hot peppers look no different to the mild ones - it is, indeed like playing Russian roulette, if with rather less drastic consequences. Perversely perhaps, this characteristic of pimientos de Padron makes them popular with children - so long as it's someone else who gets the hot one. 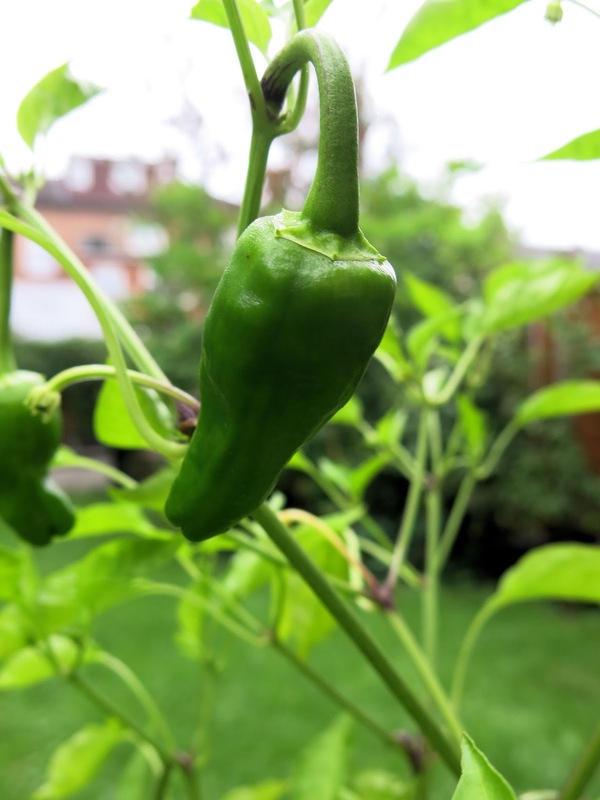 Padron peppers grow easily enough in the south of England, where the weather can also be mild but rainy. Seeds are available from Nicky's Nursery, and Franchi Seeds of Italy, among others. Sow seeds in small pots in February and place the pots indoors on a sunny windowsill. Padron pepper seeds shouldn't need any additional heat and are reliable germinators. Grow on until after the last frost, usually the beginning of May, but this year I waited until the start of June, then transplant either into large pots for the patio, or into the open ground. I usually put three Padron seedlings into a 30cm pot filled with multipurpose compost and water them well in. Here in the UK, the small white flowers should come out in June/July and the first peppers be ready to eat at the start of August. Pick the peppers young, or at least if you don't and leave them until they grow bigger and glossier, the proportion of hot ones will increase to one in two or three. They will eventually ripen to a deep red colour. Preparing the peppers to eat the traditional way is simplicity itself. Choose a frying pan that will just hold your peppers in a single layer. Pour in extra virgin olive oil to cover the bottom and place over a medium heat. Add the peppers all at once:they should be clean and dry, but they should be whole with the stalks left on. Toss them in the pan to coat with oil and fry for 5-8 minutes or so, until the peppers have wilted and the skin blistered in places. Turn out into a bowl, which you can line with kitchen towel to drain off the excess oil. Remove the towel, sprinkle the peppers with coarse salt, and serve - preferably with a Galician beer or an Asturian cider.